Our latest media release is below. It was bold, bright, and all too brief. 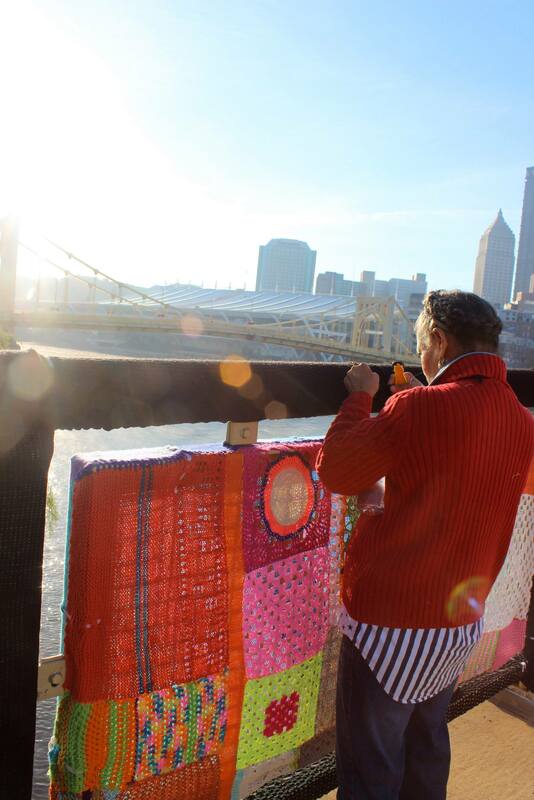 Knit the Bridge, the nation’s largest yarn bomb, on display since August 12 on the Andy Warhol Bridge, was unraveled on Saturday. 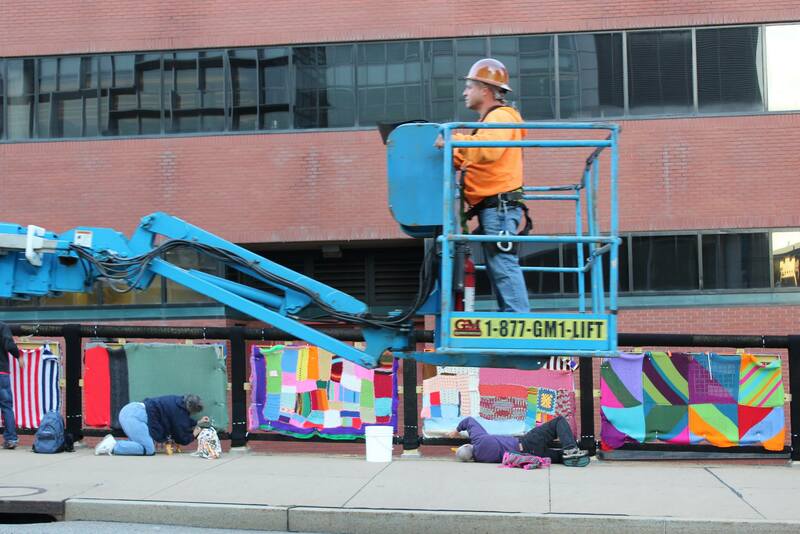 The project came down just the way it went up – as a huge volunteer effort, produced by the Fiberarts Guild of Pittsburgh in partnership with Pittsburgh Center for the Arts. The de-installation was scheduled to take all weekend but it went faster than planned so the bridge was open to traffic as usual on Sunday. Working in teams of two or three, volunteers carefully cut the cable ties that held the 580 community-created panels to the railing on both sides of the pedestrian walkway. Professional riggers removed the knitting from the towers and more volunteers separated the material from the supporting construction fencing. The panels will be commercially laundered and distributed to shelters. Knit the Bridge (KtB) is working with the Homeless Children’s Education Fund to identify local organizations with the greatest need for the clean blankets. “We actually have more requests than we have panels,” said Amanda Gross, lead artist and co-director of the project along with Penny Mateer, while noting that KtB has an additional 120 community-made blankets over and above the 580 on the bridge. Four panels are reserved as awards for KtB’s Indiegogo campaign which raised $20,000 toward the cost of the project. T-shirt sales contributed another $5,000; generous grants from local arts and community foundations (listed below) made up the bulk of the funding. During its run, Knit the Bridge was seen by tens of thousands of people – from downtown workers to international visitors. 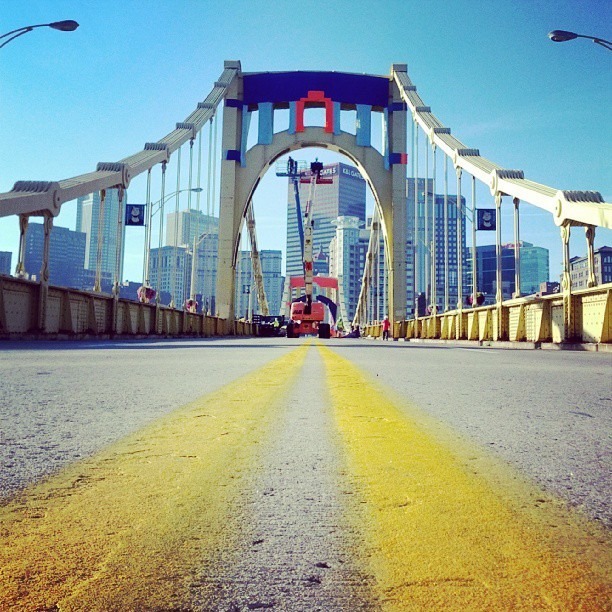 A community art party on the bridge attracted over 3,000 fiber artists, friend, and fans. Nearly 1,900 volunteers representing 95% of Southwestern PA municipalities contributed to the project which generated positive publicity throughout the country and around the world. Knit the Bridge is made possible by: the Fiberarts Guild of Pittsburgh, Inc., Fiberart International 2013, Pittsburgh Center for the Arts/Pittsburgh Filmmakers, The Heinz Endowments, and supported in part by a Seed Award from The Sprout Fund and by the Nelle M. Oliver Fund of The Pittsburgh Foundation. 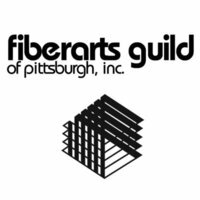 Additional support by: Awesome Pittsburgh, Colcom Foundation, Green Light Wireless, International Brotherhood of Electrical Workers, PA Council for the Arts, The Pittsburgh Cultural Trust, Pittsburgh Downtown Partnership, Spinning Plate Gallery, plus hundreds of individual donors. 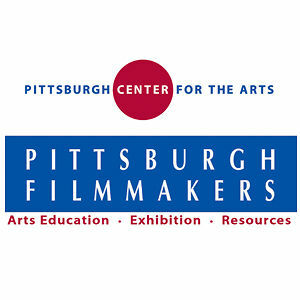 The community art party was sponsored by the Alcoa Foundation and the Pittsburgh Cultural Trust. 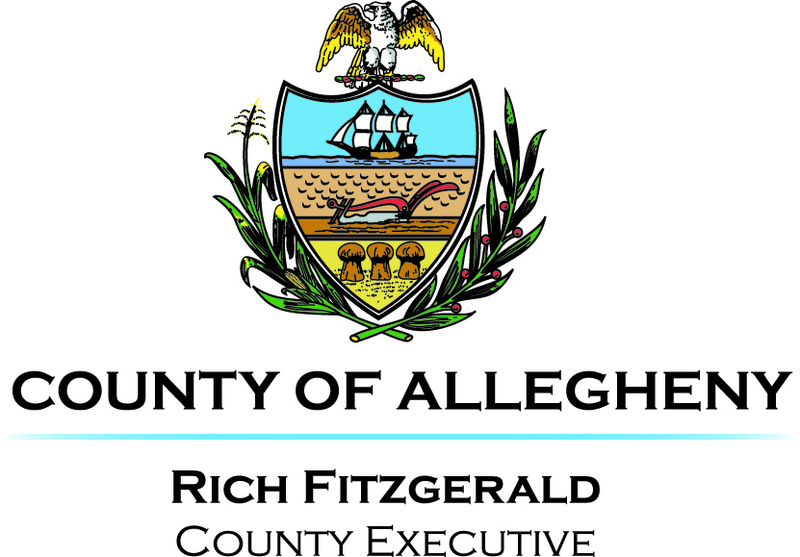 Knit the Bridge would not have been possible without the support of County of Allegheny, and particularly the endorsement of County Executive Rich Fitzgerald and Allegheny County Council. 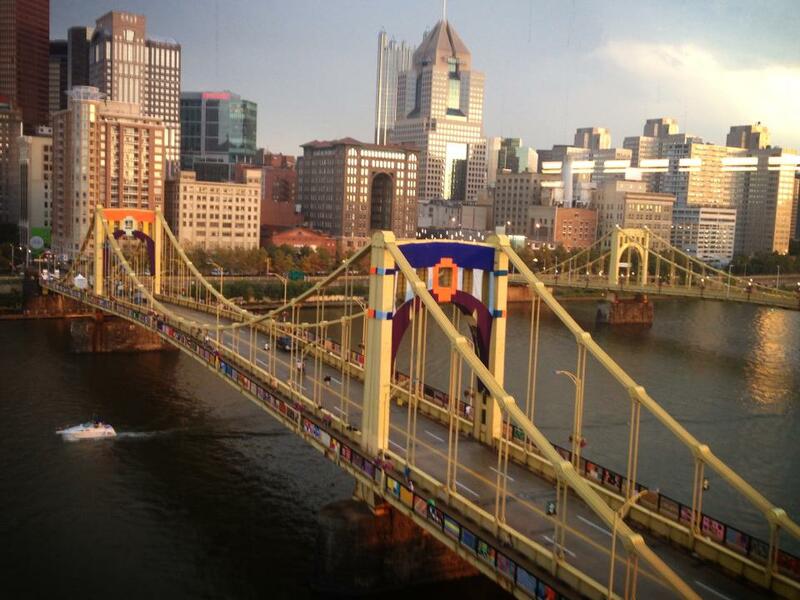 The Andy Warhol Bridge is owned by the County of Allegheny and it is through its generous support, cooperation and approval that we are able to provide this public art project which brings communities together, one bridge at a time. So glad to see it on my computer screen as I am not able to be in Pittsburgh this month. It looks great. Congratulations to all involved. What a great project this has been! It has meant so much to so many people. I want to give you some information on two of the panels. They were both put together with pieces donated by two groups (so I could get the pieces to fit best together). PNL 00298 and PNL 00297 were made by members of Northmont Church Knit Wits and Friendship Group. I hope you can add this so that the poor panels do not remain anonymous. Thank you. Fabulous! So cool to hear about this in LA this weekend. Have been excited about its impending arrival, now from afar! People NOT from the ‘burgh brought it up at at party! Extra cool. Looks great. Miss you all! Three families of college friends from Clarion, Pa, York, Pa, and Edmund, OK, met in Pittsburgh starting at the Warhol. We meet annually somewhere…Baltimore, Philadelphia, the New Jersey shore. We were thrilled with Knit the Bridge. We walked the bridge twice, took lots of pictures and hung out on the bridge soaking up the feelings of good will. So cool!